Delisa and Dylan Goodman, with the Washington Monument in the background, during their trip to the the Washington, D.C. FFA Leadership Conference. Cardington FFA members Delisa and Dylan Goodman and their advisor, Erin Wollett, traveled to Washington, D.C., on July 17 to attend the Washington Leadership Conference. They visited the National Zoo before the conference officially began. The following day they visited Arlington National Cemetery and took a night tour of Washington monuments where they learned more about the history of the United States. On Thursday a visit to the Capitol took place where they visited the National Pork Council and the American Farm Bureau Association, learning how to advocate for agricultural purposes. On Friday they visited the Newseum, an interactive museum that promotes free expression and the First Amendment to the Constitution while tracing the evolution of communication. The busiest day of the week, Saturday, began when the group began in the morning taking action and serving others by packaging 40,000 meals for people in Washington D C. Later that day, they got a well-deserved meal at a Brazilian steakhouse. Later, they had moments of reflection while visiting the Holocaust Museum. They ended the trip with cupcakes from Georgetown Cupcakes. Throughout the week, they learned what their purpose is by developing a Living to Serve Project. The two members and their advisor are excited to take action to their hometown to make a difference. 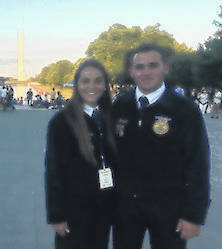 https://www.morrowcountysentinel.com/wp-content/uploads/sites/29/2018/08/web1_ffa.jpgDelisa and Dylan Goodman, with the Washington Monument in the background, during their trip to the the Washington, D.C. FFA Leadership Conference.